Northwest Plans look great in any region! Northwest architecture is inspired by nature and necessity. It is not hard to identify the nature inspiration when surrounded by towering trees, rugged landscape and amazing vistas. The Northwest response to stunning scenery is to create house designs that are in harmony with the environment. Houses are often nestled into a sloped site and the lines of Northwest house plans tend to echo the strong elements of their environment – strong vertical lines in harmony with majestic fir trees, horizontal lines to evoke the feelings of rock ledges, roof undulations to blend with the peaks on the horizon. A Northwest home design is usually clean in design, lacking excessive exterior details. When architectural accents are desired, they are usually achieved with the use of natural timber and rock to further blend the house with its surroundings. A generous use of windows creates a seamless transition between indoors and out and brings light into the interior. So what about the necessity side of design in the Northwest? The Northwest climate is well-known for the amazing amounts of precipitation so protection of residents and the very building itself is a must. The Northwest design accommodates this by implementing medium to low sloping rooflines with generous overhangs. To take this a step further, you will notice that many Northwest designs include a covered grilling area for year-round trips to the BBQ. Additional outdoor living spaces are achieved by adding generous decks, often combining open and covered areas for year-round enjoyment. A Northwest house has wonderful flow and functional interiors with modern amenities. Modern minimalist interior design is quite common as it helps with the laid-back lifestyle so common on the Coast. These designs are not limited to the enjoyment of “Coasties”. Although originating in the northwest, these houses can be built as a primary home or vacation home in any region of the country that has a natural vista or stunning cityscape to be enjoyed. 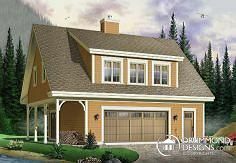 Drummond House Plans has a beautiful and extensive collection of Northwest house plans available for your family’s comfort. We also have a number of designs being worked on so you should visit the site regularly or sign up for new design notifications. I love the Northwest designs. Living in South Africa and having spent loads of time on farms in the mountains the patio and barbecue (we call them braai’s over here) are just what the doctor ordered. The generous roof overhangs mean that in summer you can have cool comfort on the porch whilst looking out over your fields. ← Previous Post: Great things come in small packages!